In preparation for laser cutting, scale all of your objects using a referenced scale technique to the size they will need to be for your physical model. Draw a 24” (wide) x 12” (high) and arrange your cuts within this rectangle. The rectangle represents the cutting bed of the laser cutter. Save your work as a .dwg file to your flash drive. 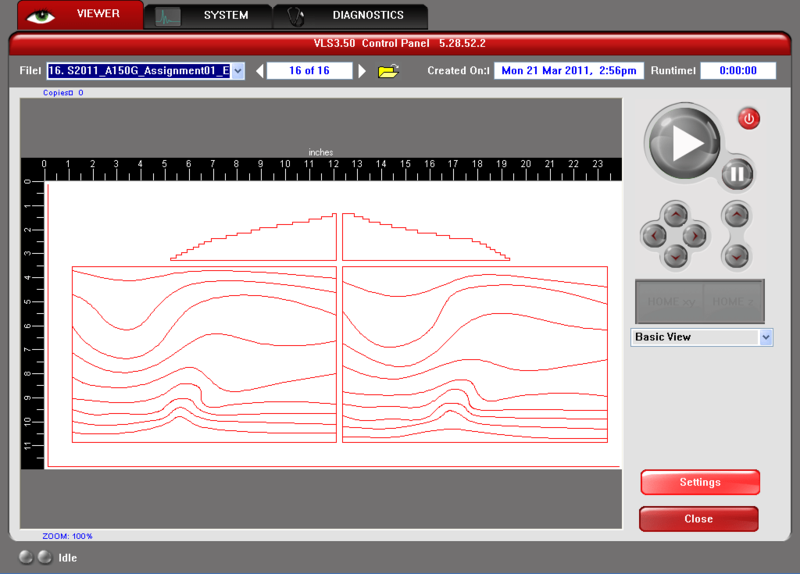 In the Laser Cutter room, insert your flash drive and open your AutoCAD .dwg file. 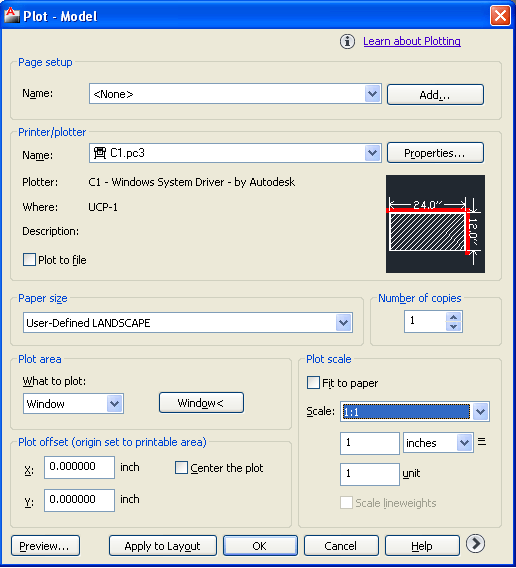 In the Plot Area drop down menu, select window and specify the 24” x 12” rectangle drawn in step 3. 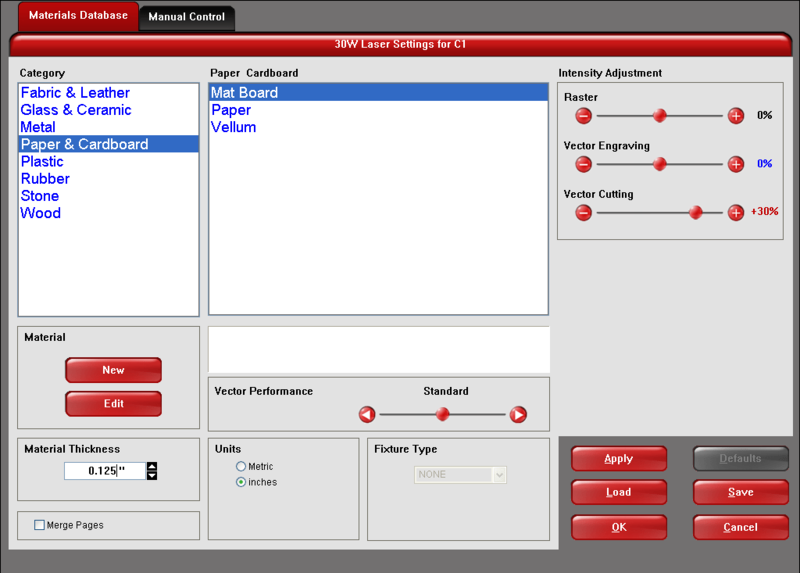 Open the Laser Cutter Software (double click on the UCP icon on the desktop). You should see your drawing in red and blue lines. If there are any other colored lines (gray/black etc.) return to step 2 and make corrections. Next, select the Settings button in the lower right. Choose appropriate settings for your cutting project. You may wish to consult the white binder of sample materials & settings for reference. You may also find that it takes several test cuts to achieve desired results. Make sure to specify the thickness of your material. After you have adjusted your settings, click on “Apply” then “Ok” and your settings will be applied to the current cut. Load your material into the laser cutter. Align the top left of your material to the top left corner of the laser cutter. Now power up the laser cutter (red button in upper right) and click on the large green “Play” button to begin cutting.